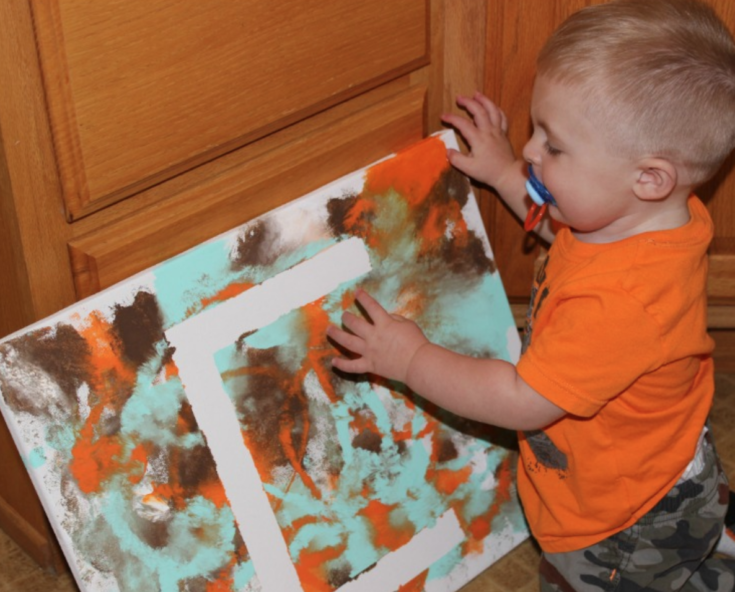 Here is a Fun Painting Activity for Toddlers – No Mess! I am a stay-at-home mom, and with that comes a lot of time to fill in our days! I wanted to do a fun painting activity for toddlers that didn’t require a huge cleanup! Several years ago I saw a project to make canvas personalized letter wall art, and I thought why not turn this into a toddler activity?!? This is a no mess way to have fun with your child and let his imagination run wild! What makes this a no mess activity is wrapping the canvas in plastic wrap before you let your toddler start creating the masterpiece. This that keeps their hands clean from the paint while still letting them be super creative! Brilliant right!?! You can create any letter you would like, use your Cricut Machine to cut out a letter on canvas and apply to the canvas, or use painters tape like I did here! Here is how Clay’s turned out. 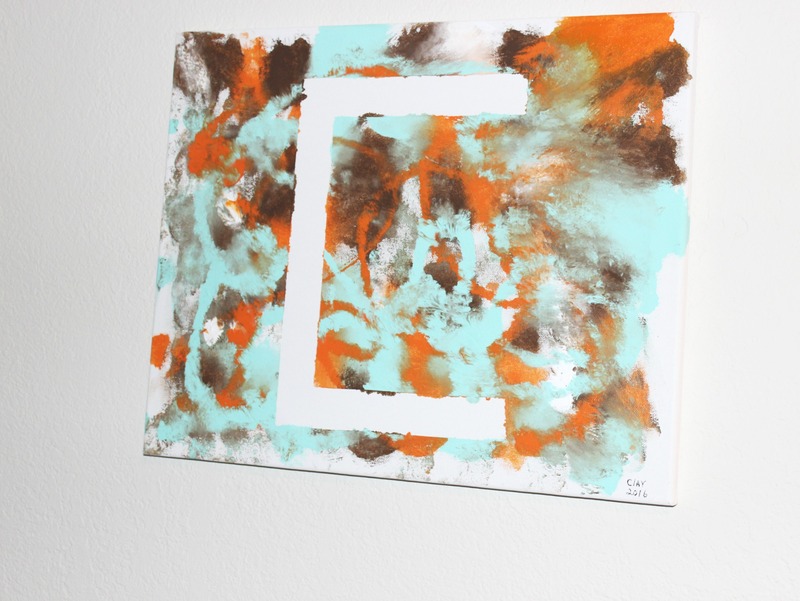 We used brown, white, turquoise, and orange acrylic paint for his colors. We taped off the letter C for him, and I think he did a really cute job! He missed a little bit of spots right around the tape so I used my finger and rubbed the paint there to help so you can see the letter really well. Other than that, he did it all by himself! I wrote his name in the bottom corner and year, so he can see when he did it, years down the road! We made ours on a 16×20 canvas, but you can choose any size of canvas you would like, or do it on a sturdy paper, it is all up to you! No set rules here! I do recommend when your child does do this, that you either have them paint in clothes it is okay to possibly get dirty or have them not wear clothes. Ours didn’t spill out any paint, but I still had him in just a diaper, JUST In Case! I didn’t want to take a chance, that it may go south and his clothes get paint all over them! 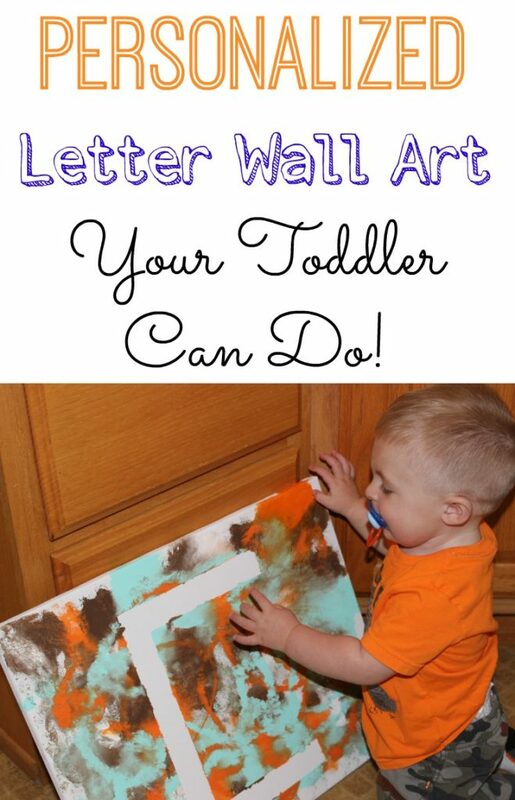 Let your toddler have fun with this mess-free activity that creates a one-of-a-kind piece of art for your wall! 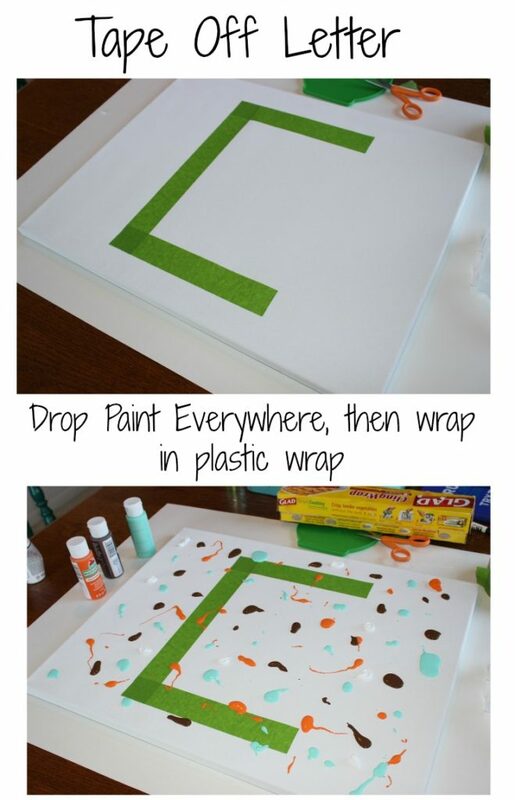 Once your letter or design is taped on, start putting dots of paint all over the canvas. It kind of soaks in so make sure to put quite a few dots. Secure plastic wrap all over the canvas. It doesn't stick perfectly but if you use a lot of it, you can protect your child's hands! Let your child start playing and spreading the paint around. Once the paint is smooshed all over, take the plastic wrap off and remove the tape before it dries. Be careful with this step. If paint isn't all around border of tape, make sure it is covered or else the design will not show well. As you can see it really is a very easy toddler craft! You can do this craft at any age, and do any design, words, or letters you want! Very versatile for sure, and simple. The most time consuming is just taping off your letters and design! I think next time I might do a quote or something for him! Clay loved doing this, and I think it turned out rather well, we have it hanging in his bedroom!